A team is overdue if the number of years since their last appearance is greater than the number of teams in their league. The table below lists all such teams as of now in no particular order. 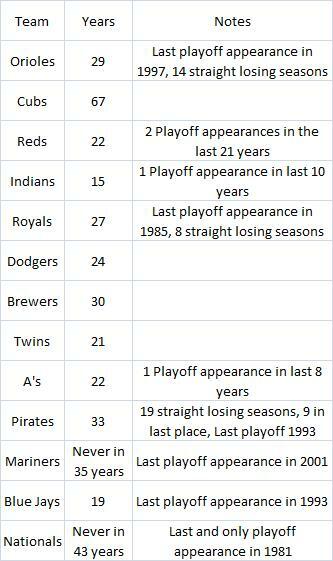 Once we get into 2012, the Indians will be 15 years from their last appearance. Some are very overdue. 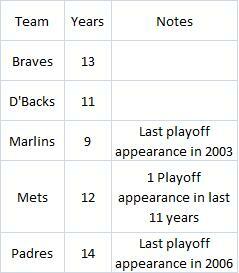 Some not only have not been making it to the World Series, but they have been doing poorly otherwise, too. 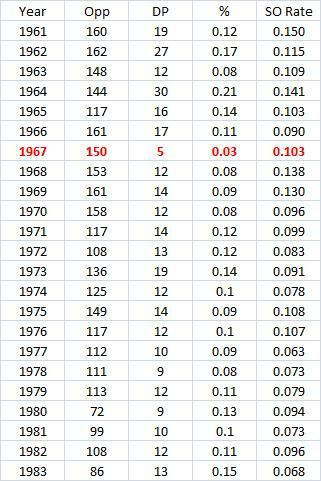 This may seem like alot of teams, but at the conclusion of the 1958 season, 11 of the 16 teams were overdue. We have always had hapless teams. The Phillies went 35 years without a pennant before finally getting one in 1950 but then went another 30 years. The original Senators did not win one in their last 27 years in Washington. The St. Louis Browns went only once to the Series in over 50 years before moving to Baltimore. The White Sox went 40 years without one until 1959 and then went another 46 years. It is probably hard to quantify "overdueness" over baseball's history to accurately assess how bad things are now. In the pre-1960 years, you could be overdue in just 8 years so it may not have felt so bad to the fans. Now it means a longer time period. Right now, it would take 7 years to clear out the back log of teams overdue and it would require all of the hapless teams to get in over this stretch (it does not seem likely). The following table shows the teams that are at least half way to being overdue. The Rangers hitters had an OPS of .800 during the season and their pitchers allowed a .698 OPS. So that is a .102 differential. The comparable numbers for the Cardinals are .766-.717-.049. The following equation gives a good estimate of winning percentage. we get the Rangers having a 57% chance of winning any given game (this leaves out home field advantage). The Rangers were even better in September, with a differenital of .298 (.916 - .618). The Cards had .125 (.807 - .682). The Rangers, however, have a negative differential in the playoffs so far of -.017 (.764 - .781) while the Cards have .096 (.793 - .699). Combining the September differential and the playoff differential in a weighted average by games gives the Rangers a differential of .208 and the Cards .116. In all playoff games, the AL teams averaged 4.87 runs per game. The AL runs per game this year was 4.46 during the regular season. The NL average so far is 4.63 (not counting tonight's game with the Cards leading 11-6 in the bottom of the 7th). If it ends up with that score, the NL average will be 4.88. If the Brewers could win 12-11 and tomorrow's game ends up 1-0, the NL average will be 4.82. The NL runs per game this year was 4.13 during the regular season. Only 10 of the 30 games so far had both teams scoring 4 or fewer runs. Only 5 games had both teams scoring 3 or fewer runs. That was by far the lowest of his career. So another reason why that season was so great. I did not see very much on this. See The Great Forgotten Season: Carl Yastrzemski, 1967 by Cody Swartz of "Bleacher Report." Yastrzemski's only season when he had a higher AVG against lefties was 1967. He also hit especially great after August 31. He batted .417 (40 for 96). He ended August with a .3085 AVG. He slugged .760 after Aug. 31. Through that date it was .594. See Was The Left Hand Of God Responsible For The Red Sox Miracle In 1967?. That season was also one of the most indispensable seasons ever, meaning his team really needed him to have a great year. See Indispensable Seasons Go To WAR! 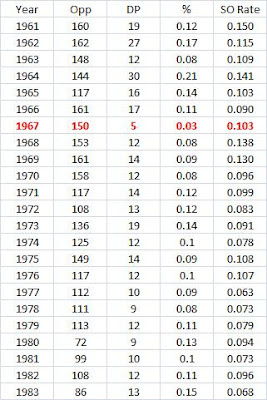 The table below show's his GDPs and GDP rate for each year of his career. 1967 was much lower than any other year. I also show his SO rate for each year (using PA - IBB - SH). Data from Baseball Reference. I thought maybe if his strikeout rate had been alot higher that year it would account for the lower DP rate. But it does not look that way. The one thing Yaz did that year that he never did before was hit alot of HRs, 44. His previous high had been 20. So maybe putting the ball in the air more helped. Baseball Reference does have his FB/GB ratios for any year. But in other years when he hit 40+ HRs, the GDP rate was not so low (1969 & 1970). Maybe he was just faster that year. How many runs did he save by hitting into fewer DPs? Averaging his rate over 1966 and 1968, I get about 9 DPs saved. What was it worth to not hit into a DP? Using Tangotiger's Run Expectancy Matrix, 1950-2010, my guess is that it would be worth between .122 and .198 runs in each case. Using the 1950-68 matrix, with a man on 1st and 2 outs, the run expectancy is .264. With 2 outs and none on, it is .066. So if there is a man on 1st and no outs and Yaz strike's out or beats the throw to first, you save .198 runs. Doing something similar with a man on 1st and 1 out gets us .122 runs saved. The average of those two is .16 and over 9 DPs avoided, it is just 1.44 runs. That may not be much but when the Red Sox and Twins played the last game of the season tied for first, the lower DP total might have mattered. If I used run values from the 1999 Big Bad Baseball Annual, a GDP was -.37 runs and other outs were worth -.09. So not hitting into a DP and making another kind of out saves .28 runs for a total of 2.52 runs over 9 DPs avoided. Now maybe Yaz got hits instead of hitting into DPs. But the two other years when he hit over .320 he had about a 10% GDP rate, still much higher. So we can't simply say he hit better that year and that caused the lower GDP rate. "Data guys" More Important In Business Due To "Moneyball"
See When Data Guys Triumph by CADE MASSEY and BOB TEDESCHI, NY Times business section, 10-2-11. Oakland A's general manager Billy Beane and author Bill James are entrepreneurs who created a whole new way of running baseball teams based on statistics and this creative spirit is starting to have an impact in the business world. "JOSHUA MILBERG has plenty of business cred: an M.B.A. from Yale, experience in the mayor’s office in Chicago, a job as a vice president for an energy consulting firm. But all of that, Mr. Milberg says, matters less than his reputation as “the data guy” — someone who can offer insights through statistical analysis. And for that, he and a growing number of young executives can credit none other than “Moneyball: The Art of Winning an Unfair Game,” by Michael Lewis." These managers are savvier with data and more welcomed in business circles in part because of the book." "At its heart, of course, “Moneyball” isn’t about baseball. It’s not even about statistics. Rather, it’s about challenging conventional wisdom with data." "This evangelism has created opportunities for the analytically minded." The article calls this work "creative empiricism." "But “Moneyball” dramatized the principles behind these forces: a reliance on data to exploit inefficiencies, allocate resources and challenge conventional wisdom — and thus broadened their appeal. “Moneyball” traces Billy Beane’s use of unorthodox analytics to the work of Bill James. Working as a baseball outsider, Mr. James began self-publishing his analysis and commentary in 1977 and built a passionate following." "Once people see the value of a batter’s O.P.S. — on-base plus slugging percentage, a key measure in the book — it’s a short step to applying similar principles in their own organizations." "Generation Moneyball isn’t yet in charge. But as the Nobel laureate Max Planck once said, “A new scientific truth does not triumph by convincing its opponents and making them see the light, but rather because its opponents eventually die, and a new generation grows up that is familiar with it.”"
And people say I shy away from the controversial topics. I used all teams from 1996-2009. For OBP I used (H + BB)/(AB + BB). The r-squared was .897 and the standard error was .1608. That works out to 26.05 runs per season. The r-squared was .907 and the standard error was .153. That works out to 24.77 runs per season. So using 1.8*OBP + SLG is a bit better. The standard error is 5% lower. It is also 1.28 runs lower. That would be worth about a tenth of a win. The r-squared was .798 and the standard error was .0311. That works out to 5.04 wins per season. I used all teams from 1989-2002. The r-squared was .815 and the standard error was .0298. That works out to 4.83 wins per season. So again, as in the analysis of runs scored, 1.8*OBP + SLG does just a bit better. One reason why 1.8*OBP + SLG only does slightly better is probably that the range of OBP and SLG across teams is not that great. But for individual players, the range varies much more. So it might make more sense to use 1.8*OBP + SLG instead of OPS in those cases. Do Diamondbacks have stats to match Brewers stars? "The Diamondbacks might not have the Brewers’ marquee names. But the numbers, and the results, show two teams that are surprisingly similar going into Saturday’s Game 1 of the NL division series." This sounds like an interesting question yet very few numbers are presented in the article. Actually no numbers that statistically compare the two teams. It turns out, that by luck, the Diamondbacks over achieved with runners on base, a trend that no team can keep up. It looks like the Brewers are much better. Their hitters had an OPS of .750 while their pitchers allowed a .689. That gives them a differential of .061. The Diamondbacks hitters had an OPS of .736 while their pitchers allowed a .725 OPS. That gives them a differential of .011. Well below the Brewers. This gives the Brewers a pct of .579 or 93.85 wins. The Diamondbacks get .514 or about 83.32 wins. This seems like a very big difference. 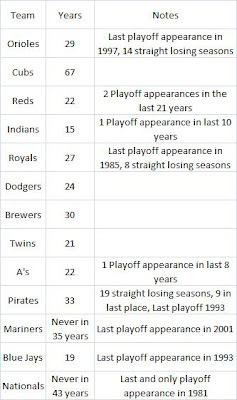 Yet the Brewers actually only won 2 more games (96 vs. 94). And the Brewers runs differential (721 - 638 = 83) is only slightly higher than the Diamondbacks run differential of 69 (731 - 662). What allowed the Diamondbacks to match the Brewers, at least on the surface? Some very good luck. They over achieved with runners on base. The Diamondback hitters had an OPS of .770 with runners on base (ROB) while their pitchers allowed .731. That gives them a differential of .039. The Brewer hitters had an OPS with ROB of .745 while their pitchers allowed .719 for a differential of .026. This seems to be something in favor of the Diamondbacks, but it really isn't. Doing better with runners on base will improve your chances of winning. You will score more runs than expected and give up fewer runs than expected. Yet, in the long-run, individual players and pitchers (and teams) end up performing about the same in clutch situations (like ROB) as they do overall. Even the best clutch hitters and pitchers do just a little bit better in any clutch situation than they normally do given a large enough number of games. For the Diamondbacks to to even look like they are as good as the Brewers, they had to be lucky. We cannot expect them to continue to over achieve so much with runners on base.